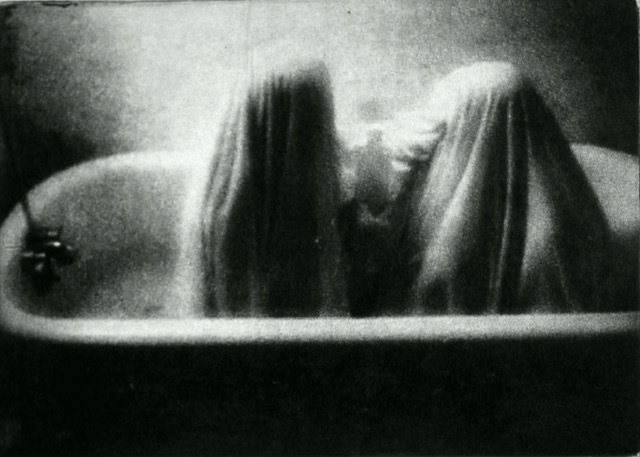 Jenn Reidel's photo etching "She placed her ghosts in the bath in an effort to clean up her past." will be on display during the Quartermaster Press 25 Retrospective Exhibition at Vashon Center for the Arts, April 6 - May 25, 2018. Jenn is a conceptual artist whose narrative work combines her favorite mediums of photography, performance, printmaking and writing. She joined Quartermaster Press in 2004 and created two series, which were exhibited at Gallery 070, "Ghosts in Love" (2004) and "A Fury Tale" (2006). She printed the images first as fine art black and white photos in a traditional darkroom and then used a photo-etching process to mimic 19th century photogravures. She transferred the photographic image onto a copperplate and printed them by hand at Quartermaster Press.